Do Side Effects Indicate a Cancer Drug Is Working? Chemotherapy often carries the perception that the treatment is worse than the disease. The approach earned this reputation decades ago, but today it does not represent the reality of mesothelioma treatment for most patients. Cancer drugs do cause uncomfortable and sometimes dangerous side effects. However, the expectation of severe side effects can sometimes lead patients to feel anxious, confused and even frustrated if it turns out their treatment regimen isn’t so bad. In cancer treatment, the idea of “no pain, no gain” is a myth. A positive response to treatment depends in large part on minimizing and managing side effects. Prescription medication can control some side effects, and the new generation of cancer drugs causes fewer side effects to begin with. Dr. Raja Mudad, medical director of the chemotherapy treatment unit at the Sylvester Comprehensive Cancer Center in Miami, has experience treating mesothelioma with chemotherapy and immunotherapy. “Most patients have heard about side effects from reading on the internet or via other patients,” Mudad told Asbestos.com. When patients do this sort of informal research, they may come to expect side effects such as complete hair loss, crippling nausea and debilitating fatigue during treatment. “Most patients are usually apprehensive about taking chemotherapy because of this misconception,” Mudad said. Some patients even assume if they don’t experience side effects, the treatment is not working. Mudad debunked this myth. Cancer and chemotherapy can both cause fatigue, digestive problems and low blood cell counts, so it’s easy to confuse mesothelioma symptoms and drug side effects. Symptoms are adverse effects caused by tumors pressing against or invading organs and tissues in the body. As cancer develops, it can also cause painful fluid buildup as well as weight loss and fatigue when cancer cells use up the body’s energy supply. Side effects are adverse effects caused when drugs damage healthy cells in addition to cancer cells. Chemotherapy drugs usually affect all rapidly reproducing cells in the body, especially cells in the stomach, intestines, bloodstream and hair follicles. Response is how doctors describe a drug regimen’s effect on cancer. A “complete response” means the cancer has disappeared, while a “partial response” means the tumors have shrunk. “Stable disease” signifies no effect, and “disease progression” means tumors are still growing despite the treatment. A positive response does not depend on a patient enduring harsh side effects. In fact, side effects are precisely what limit the effectiveness of cancer treatments in many cases. For example, nausea and vomiting are two of the most common side effects of chemotherapy. In addition to reducing quality of life, these side effects can prevent patients from getting the nutrition their bodies need in order to heal. 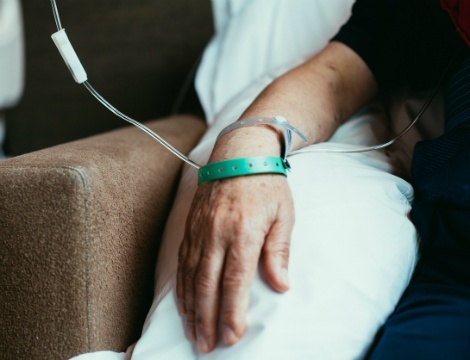 “Nowadays, we have better drugs to prevent side effects, and most patients do not experience many side effects from chemotherapy,” Mudad explained. To help patients manage nausea, doctors often prescribe a medication such as palonesetron (Aloxi), aprepitant (Emend) or ondansetron (Zofran). Chemotherapy can also cause rare, life-threatening side effects depending on a patient’s blood chemistry and overall health. Even if a treatment is proven to kill cancer cells, if it comes with an unacceptably high risk for an individual patient, doctors may have to reduce the dosage so much the treatment is no longer effective. For this reason, researchers are constantly searching for ways to reduce the toxicity of cancer treatment. Doctors can administer less-toxic drugs in higher doses, which increases the likelihood of a partial or complete response. Mudad reported positive developments in mesothelioma treatment. Avastin is a brand name for bevacizumab, which the National Comprehensive Cancer Network (NCCN) added to its recommended treatment regimen for mesothelioma in 2016. Researchers continue to study immunotherapy drugs such as pembrolizumab (Keytruda), nivolumab (Opdivo) and ipilimumab (Yervoy) in mesothelioma clinical trials. American Cancer Society. (2016, March 15). Questions about chemotherapy. National Cancer Institute. (2015, April 29). Chemotherapy to Treat Cancer.